Tesla’s merger with SolarCity has sent shockwaves through the solar energy world. The latest development from the new company is a Tesla “Solar Roof”. This is essentially an entire roof replacement that consists of both solar and non-solar glass tiles. The overall effect is what Tesla is calling an “invisible roof”. It’s certainly a cleaner look than a solar panel array on the roof of your home (though at this point in time, solar panels on your roof are trendier than not having them). The blend of a solar roof that looks great and can generate massive amounts of energy for your home is an attractive prospect for any homeowner, but the main question is: does this make sense for your home compared to a traditional solar panel installation? To begin our investigation into how a Tesla solar roof compares to typical solar panels, we’re going to break down the cost of installation and the solar production created by the roof. For our example, we are going to use a 3,000 square foot home in California (Energy Sage did a similar comparison). If you go with the solar roof option, it’s going to set you back $50,900. If this seems high, that’s because it IS high! The Tesla Solar Roof is essentially both a new roof AND a solar system array, and the price reflects that. The cost of a traditional solar system for the same home would be approximately $26,000 (before federal tax rebate is applied). Just going off of the base price, the solar roof for this 3,000 square foot home is essentially $25,000 more than a full solar panel system on the same home! Okay, so the solar roof is double the price of the solar panels, it must generate a lot more power then right? Actually, not really. For our example home, the solar roof would actually generate only about 70% of the energy that the solar panels could. The $26000 solar panel system would be a 8.5 kW system, while the $50,900 solar roof would only be a 6.25 kW system. This is largely because the roof, while it covers more area, is less efficient and has a mix of both solar and non-solar tiles. When it comes down to it, the Tesla solar roof is mainly a luxury option at this point. It costs much more and produces much less than installing a standard solar panel array on your home. However, below we have detailed some situations in which installing the solar roof could make sense for you. Money isn’t an object. Just like Tesla’s cars, if you have the money and are gung-ho about renewable energy, the Tesla solar roof just makes sense. You need a new roof anyway. If you already need a new roof, than the Tesla solar roof can seem much more reasonable. If you were to go ahead and get a new roof installed along with a new solar panel array, than your cost would approach the cost of a new solar roof. It likely wouldn’t be as much, but the difference in cost could actually make it a feasible option for you. They are supposed to last a lifetime. Tesla claims that their solar roofs are built to last for life. Considering the expense and headache that goes into roofs, this is a very attractive prospect for homeowners. Tesla offers a lifetime guarantee, so essentially you’d never have to worry about replacing or repairing your roof again! It looks great. 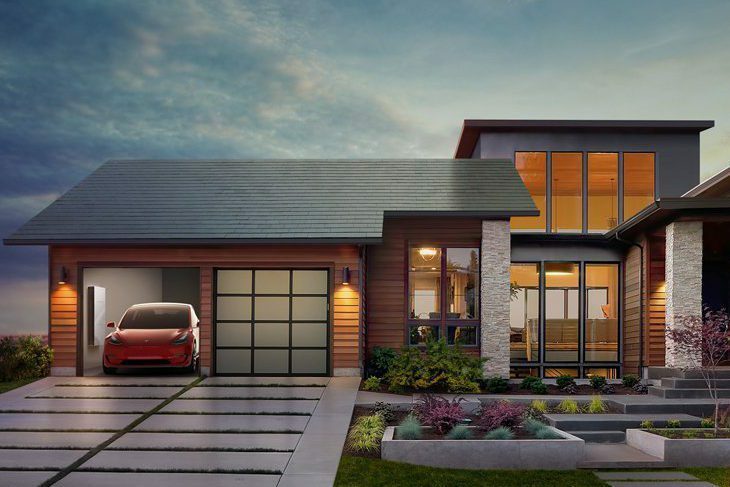 While we have to remain open-minded about the aesthetic look of a typical solar array on residential homes, there is no doubt that the Tesla roof just looks better. It’s a clean, conspicuous look that any homeowner can appreciate. It comes with a Tesla Powerwall. The Tesla Powerwall is one of the best products available when it comes to maximizing your solar energy. It stores energy during sunlight hours and makes that energy available during the night. Energy storage is one of the bottlenecks of solar, and the Powerwall is the latest in attempts to combat that. Additionally, it can power your home in case of a power outage! The Tesla Solar Roof is a fantastic innovation, much like their electric cars. Does it make sense for many homeowners? No, not really. But it’s definitely something that we can see being installed on all new homes in the future. It’s definitely a step in the right direction for the aesthetics of solar. Right now, it’s a bit expensive to make a lot of sense. But there is no doubt that they will continue to make it a more efficient and less expensive technology. Man, the solar space is so exciting!